IT IS ORGANISED BY A TEAM OF VOLUNTEERS THAT WORK ALL YEAR TO MAKE IT A FUN EVENT FOR ALL THE FAMILY. YOU ARE INVITED TO COME ALONG AND WATCH, OR YOU CAN GET INVOLVED BY DRUMMING WITH US, HELPING TO SET UP THE PAGEANT, OR AIDING WITH THE MANY OTHER NUMEROUS TASKS. WE COULD DO WITH YOUR HELP. The children scream as the Giant’s head appears into view, the drums roll, the mayor quivers with fear, the knights horse rears its head in anticipation of battle, as the gentle St Anne plots her plan. The cliffs are lined with onlookers in the thousands; the air is filled with the sounds of women wailing, combined with the roar of the Atlantic’s might. 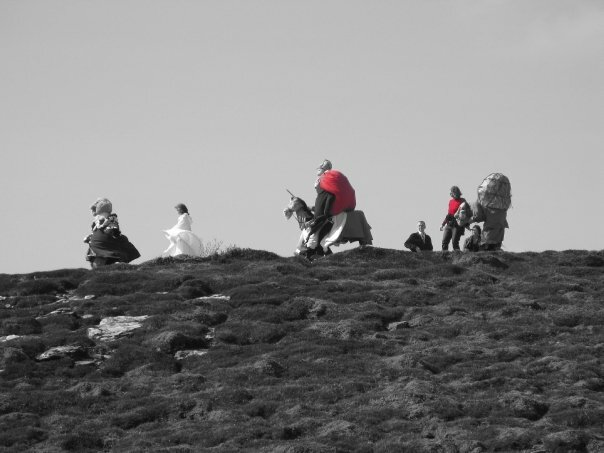 This is the scene set out on the stunning cliffs at St Agnes’ Chapel Porth beach each May Bank Holiday weekend as part of the village’s annual Bolster Festival. It tells the tale of the Giant Bolster, who having ravaged the locality and terrified the locals is finally brought his comeuppance by a fair village maiden. 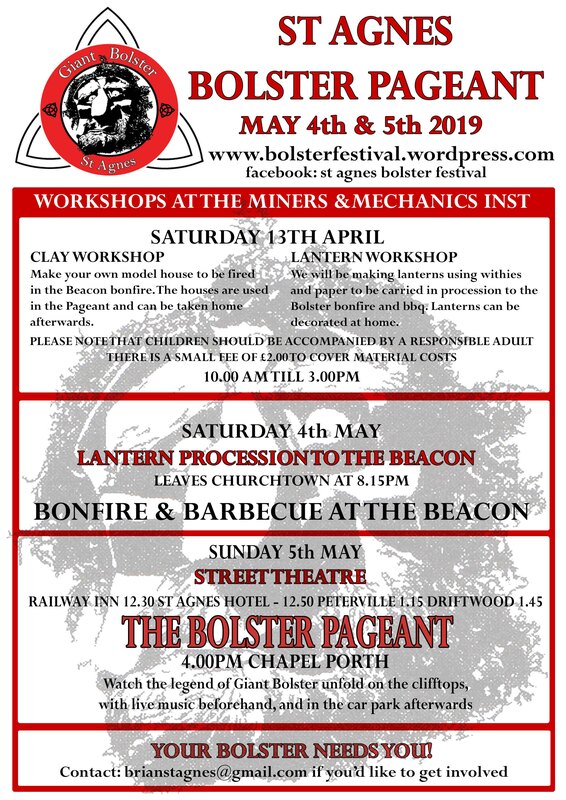 On the Saturday evening a lantern procession leaves Churchtown at the centre of the village, heading for the highest point in the locality, The Beacon, where a bonfire is lit to fire clay houses that local children have made. These houses are then taken to the cliff side and symbolise the villagers’ homes, as part of the pageant. On returning to the village after enjoying the food and music, there’s the opportunity to enjoy live music in the village’s pubs. The pageant itself starts at 12.00 noon on the Sunday, when the Village Mayor, joined by the brave Knight Sir Constantine and the hard done by Mrs Bolster, parade the hostelries of the Village, gathering support for their cause in defeating the Giant. 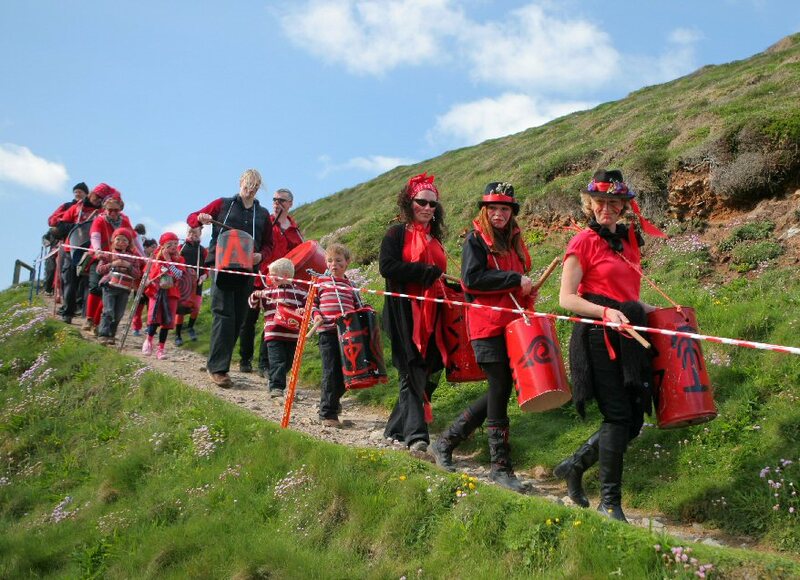 Dancers, a drum band and life sized puppets set the scene for the pageant that takes place later in the day, at 4.00pm at Chapel Porth beach. Members of the public are welcome at all of the event’s proceedings, and there is no charge. For those that want to get really involved they can get themselves made up in traditional fashion, in preparation for the day’s festivities. Saw the Bolster Giant last year. What a great event. Looking forward to it this year. I do graphic design, so if you want a better map on the flyer this year let me know. My wife is Hazel Bolster she is from a Bolster family originally from County Cork latterly of Leamington Spa we are here in St Agnes to celebrate Bolster Day tomorrow .Looking forward to getting a selfie with the Giant Bolster .Good luck to the hard working organisers of the Festival long may you continue with your brilliant event.